Captain Daniel “Old Granddad” Hendricks and his wife, Millicent, were having a cocktail party and the mood was festive until screams were heard. At the base of the third-floor stairs lay Old Granddad Hendricks–dead. It seems someone made sure the Captain swallowed the anchor early. To purchase tickets, call the museum at 540-663-3680, or click here. 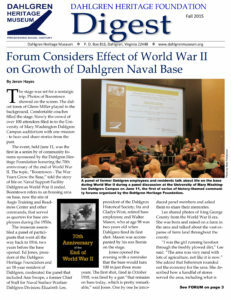 You can also order tickets by mail by sending a check payable to Dahlgren Heritage Foundation, PO Box 816, Dahlgren, VA 22448. All sales are final. Tickets purchased by phone or mail will be held at will call and picked up the night of the event.